The Lord Lyon is the heraldic authority for Scotland. He deals with all matters relating to Scottish Heraldry, Coats of Arms and maintains the Scottish Public Registers of Arms and Genealogies. It is not widely known there is no such thing as a clan crest or family coat of arms. Arms belong to only one person at a time and a clan chief has Arms that are personal to him or her and which no-one else can use. A member of a clan is allowed to wear the chief’s crest encircled by a strap and buckle containing his motto. Application for a new Grant of Arms, either personal or by corporate bodies. 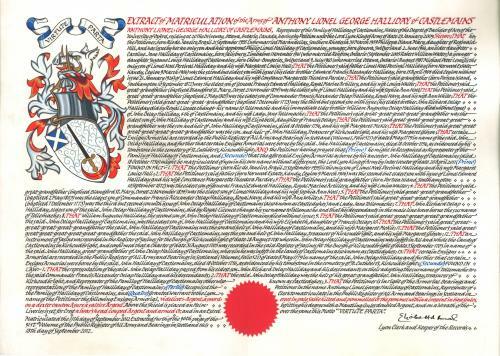 In certain specific conditions, application for a Grant of Arms to an ancestor. Application to matriculate an existing Coat of Arms. All statements made in Petitions must be accompanied by legal proof, usually certificates of birth and marriage for statements of parentage and ancestry. It is the Petitioner's responsibility to provide this proof. Petitioners may employ their own genealogist to research and provide the proof. I would be pleased to discuss the evidence required and the procedure, if you have a Scottish ancestor who was granted Arms or you wish to petition the Lord Lyon for new Arms.